One of the most confusing aspects for an organisation wishing to deploy an e-signature solution is understanding the technical jargon that different providers use. 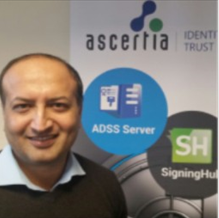 There are many e-signature schemes being offered in the market, with significant differences in terms of security and trust. However there is very little documentation that explains these different techniques and thus allows them to be compared and assessed for their suitability in meeting a particular business purpose. Due to our extensive research in this area we have developed a high-level eBook "Choosing the right type of e-signature" with key information that helps business managers and technical architects understand the various types of e-signature that exist. 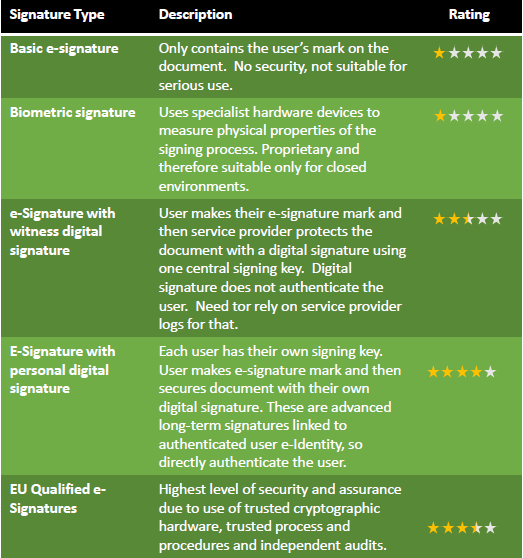 The research discusses each of these e-signature types in terms of how they work and the security and trust they provide. We also look at their legal acceptance in a court of law and how difficult they could be to repudiate. It's important to not forget about the useability and commercial issues, so we have also analysed the ease of use, interoperability and costs of each of the above e-signature types. A simple star rating scheme is used for easy analysis. 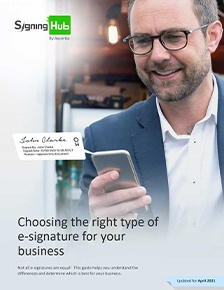 Read the full analysis in our eBook "Choosing the right type of e-signature"
It will help you to understand the different concepts and then perform a risk-based approach in determining which is the right e-signature scheme for your business. As a result you won’t get caught out by implementing an e-signature solution which is not fit for purpose. Remember the one constant in business processes is “change”, so as soon as you deploy e-signatures for one purpose another business requirement will emerge. It is therefore important to choose an e-signature solution that is capable of supporting your needs today and yet also has a flexible architecture that can support your future business requirements.